Cuckoo for Koo Koo Birds! I was in Walmart a few months ago – which should give you an idea about the amount of time each one of these posts is in production from the time we start until it finally airs – and there was this dump basket of Pillow Pet-like creatures but unlike Pillow Pets, they had embroidered cartoon eyes and an electronic chip inside that made a noise when squeezed. I looked at the copyright date on the tag and it was 2010. 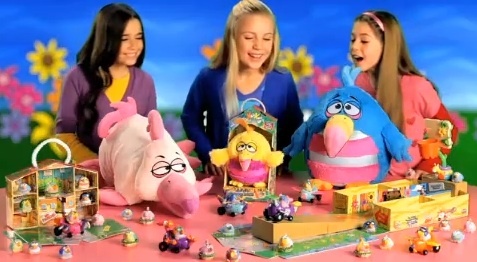 I know Angry Birds came out in late 2009, but I think even if these pillow creatures debuted in 2010, it was surely just by chance that the bird had the same general look. After all, it was one bird pillow among a sea, a veritable dump basket, if you will, of mammal pillows. 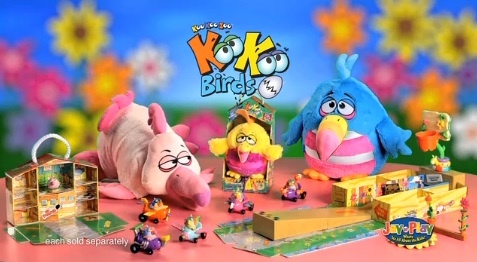 If they were consciously ripping off Angry Birds, they’d have all been birds. Go ahead, click on the photo above to watch the commercial! Or just look at these other two images, I don’t care. It says “Available only at Toys R Us” but I know what I saw. (A big dump basket of pillows.) Anyway, who knew they still made such great frenetic toy commercials?! Look what we’re missing out on now that we’ve all got DVRs and blow through the commercials when watching “Maury” (presuming they advertise on “Maury,” which I think is a safe bet). And yes, now they’re totally ripping off Angry Birds. And I for one say, “Good for them!” for no reason whatsoever. I have no stake in the matter. I don’t have a pony in this race. But, hell, “Good for them,” right? Sure, why n0t. This is all conjecture, of course. It’s all probably just an enormous coincidence like my attorney said. Hey, I bet if I put “Angry Birds movie CGI Pixar Lady Gaga voice” in here I’ll get more than my usual four or five hits today. Posted by Ted on August 30, 2011, 9:00 AM.